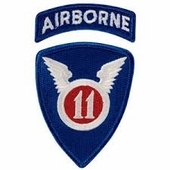 The 11th Airborne Patch was worn from 18 December 1942 to 1 July 1958. The division was originally activated in February 1943 at Camp Mackall, North Carolina. The red, white and blue refer to the national colors. The "11" indicates the unit's numerical designation and it's airborne function by the wings. Decorations: Presidential Unit Citation, Philippine Presidential Unit Citation. Our 11th Airborne Division Army Patch is a regulation, full color, embroidered military patch. This is the same patch that is supplied to the U.S. Army, Army National Guard, Army Reserve units, and sold in the Army Post Exchanges. This patch would be a great gift idea and a wonderful addition to your patch collection.